A stack is a linear data structure that works based on a rule called Last In First Out(LIFO) or First In Last Out(FILO). It follows a particular order in which operations are performed. This means that the element which is inserted last is removed first. For example, when CDs are placed in a CD stand, then the last CD which is placed in the stand is the first one that comes out. Here, CD 1 is inserted first, followed by 2,3,4, and 5. But CD 5 is the first one to be removed from the memory. Initially, every stack must have a particular amount of memory block, which we can call it as a capacity of the stack. So, what is the capacity and how will we decide? We can decide it either by dynamic memory allocation or by static memory allocation. Static memory allocation is nothing but a constant memory allocation. In static memory allocation, we are simply using the concept of an array. push(): Adds an item in the stack. If the stack is full, it is said to be an Overflow condition. pop(): Removes an item from the stack. peek(): Returns top element of stack. isEmpty(): Return true if stack is empty, else false. push(), pop(), peek(), and isEmpty() all take O(1) time as we do not run any loop in any of these operations. Java stack is LIFO object that extends Vector class. It has only one constructor which is empty or default constructor. So, when we create a Stack, initially it contains no items that means Stack is empty. Stack has s TOP pointer that points to the top of the Stack element. If Stack is empty, TOP refers to the before first element location. Sentiment analysis based on reviews- latest review gives most recent scenario, so it should be given more importance to decide further action. Stack is used in some scheduling algorithms. Stack is used during Depth First Search(DFS). Forward and backward feature in web browser. Converting an infix to postfix. Redo-undo features in many editors like photoshop. As already stated, Stack data structure has TOP pointer to refer the top element of the Stack. 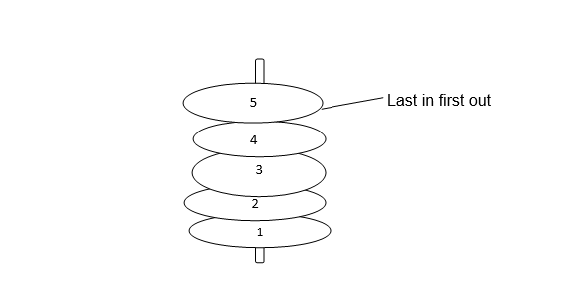 If Stack is empty, this refers to the before first element as shown below: Now, Stack’s Push operation always inserts a new element at the top of the Stack. Stack’s Pop operation always removes an element from the top of the Stack. Boolean empty(): Checks if the Stack is empty. E push(E item): Pushes an element onto the top of the stack. E pop(): Removes an object at the top of the stack an returns that object as the value of the function. E peek(): Looks at the object at the top of the stack without removing it from the stack. Int search(Object o): Returns the 1-based position where an object is on the stack. Now let us take another example and check if the stack is empty, find the size of the stack, and search for an element in the stack. The linked list implementation of stack is dynamic. It can grow and shrink according to the needs at runtime. But, this implementation requires extra memory due to involvement of pointers.